As you arrive in Brisbane it’s not difficult to find us. 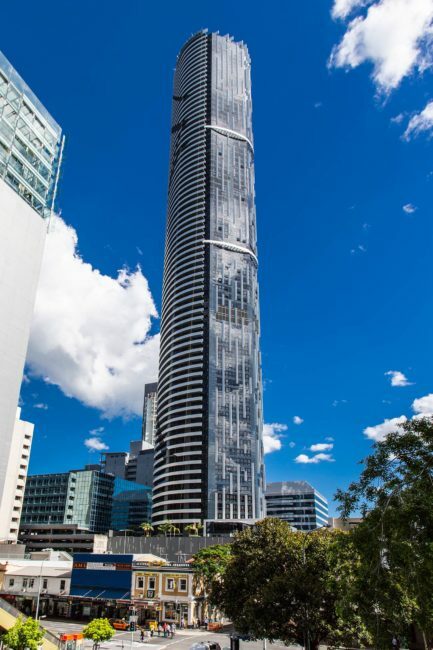 As Brisbane’s tallest building, our Meriton Suites Herschel Street stands out in a striking sky-high tower, of an impressive 74 levels high. As our Guest Services Team welcome you anytime, 24 hours a day, from the second you enter you’ll be treated to uncompromised service at every interaction. Each of our 260 beautifully appointed suites are fully equipped with the finest of furnishings and luxury amenities that go hand in hand with the Meriton Suites name. Designed to cater to all groups and sizes, all of our accommodation options feature generous open plan living spaces, delivering far greater value than a typical hotel room. Sleep soundly on deluxe bedding and immerse yourself in the morning and afternoon sunshine that filters into the rooms through floor to ceiling windows. Our guests who choose the 2 or 3 bedroom Altitude Suites will enjoy superior comfort in oversized suites with the best in modern furniture. Each space offers a gourmet kitchen and internal laundry facilities and are completed with a second full bathroom. You’ll be spoilt with unrivalled views of the bustling city below and beyond. At night as you watch Brisbane come to life, you’ll be treated to an exclusive and unforgettable sight, only available from Brisbane’s tallest building. If you choose our Parkland and South Bank Penthouse options prepare to be pampered in extravagance, from the very top of Brisbane city. As you nestle amongst the clouds and relax in our top floor, sky-high penthouse suites, the sights are sensational. First-class touches like luxurious king-sized cloud mattresses and lavish bedding, plush bathrobes and slippers and an in-suite telescope make you feel like a rockstar. And extras like hand-crafted bathroom amenities, Nespresso Creatista coffee machine, GHD hair straightener and luxury daily turn-down service, provide a remarkable experience for all. Like all Meriton Suites hotels, we have the perfect leisure facilities for you to unwind and maintain your fitness regimes with an indoor heated lap pool, spa and sauna plus a fully-equipped fitness centre. Check in with your nearest and dearest or catch up on your work with fast and complimentary Wifi available everywhere throughout the hotel. Whether you arrive for work or play even the pickiest of travellers will be impressed with Brisbane’s edgy art scene, thriving nightlife, and award-winning food and wine. Emerging as one of Australia’s most progressive centres, your plate will be full of things to do and see with a busy cultural calendar, in glorious tropical year-round weather. Why not make your stay extra special with five-star living, stunning views and a perfect location to get the most of your trip! Whether you’re staying with a work colleague or the whole family, our Meriton Suites Herschel St provide the perfect base for exploring the south-eastern corner of Australia’s Sunshine State, Brisbane. If I cancel my reservation will I be charged?